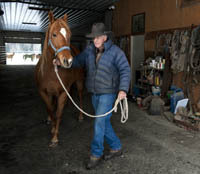 It took 40 years to get there, but 81-year-old horse breeder Jim Walker is grateful that he hung in long enough to meet with success. “For me, it’s a dream come true,” he said. During the last three years, the retired founder of Walker Sand and Gravel south of Bellevue hit it big in the competitive world of horse racing. “I came home from the Idaho Quarter Horse Association banquet this year with seven trophies. It was kind of embarrassing,” Walker said. Two years in a row, Walker’s three horses won the State Championship for Quarter Horse Racing in Boise. In 2013, his horses took both first and second place in the state competition. He also won a regional championship race in Jerome. Walker bred and owns quarter-horse geldings Time for Jesse Lee and Jesse’s Perfect One, as well as thoroughbred Spot of Salt, in partnership with Sam Stevenson of Boise. During one eight-month period over the last two years, these horses won 16 races, from Idaho to Oregon and California. “Horse breeding can become very wayward in a hurry. It’s a big gamble and takes a lot of devotion,” Walker said. Walker’s gamble, and hard work, finally paid off. “Last year’s winnings were over $100,000,” he said. “But it takes a lot of money and hard work to do what we are doing. A lot has to fall into place. You also need a lot of luck,” he said. Walker’s horses were trained for years in Utah. Recently, they have been trained in Jerome by Monty Arrossa, Walker said.